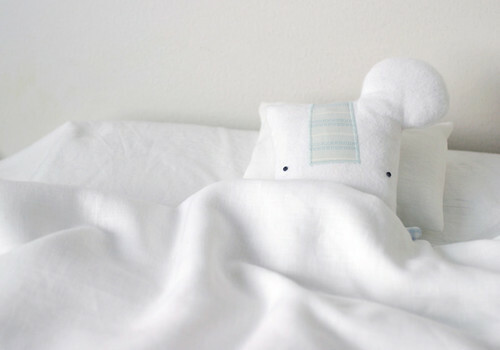 Rag Pets – Handmade soft toys from Helsinki, Finland: It's Giveaway Day again! This is Flakey the rag-snowflake. He's an unique little snowflake at about 22 cm tall. 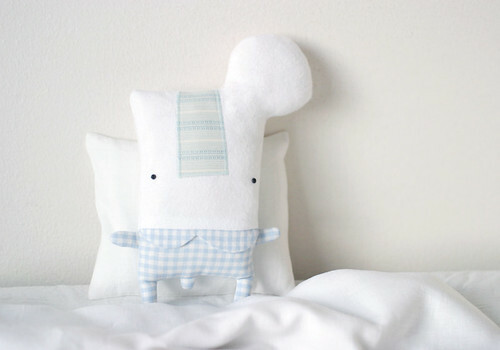 Flakey made out of soft snowy white flannel and his nose is appliqued stripy blue cotton. 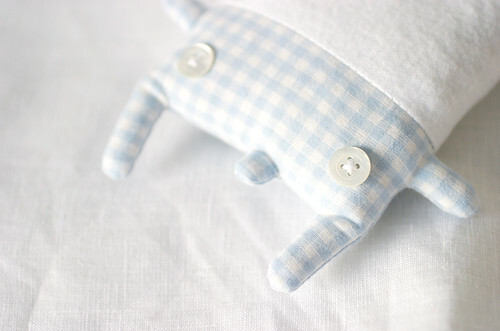 He has little button eyes and he's wearing snuggly cotton gingham pyjamas with mother-of-pearl buttons on the back. Flakey is filled with rags and wool. Since going to bed early makes Santa come quicker, Flakey has donned his PJs and is going to sleep now in order to make the presents come faster! To celebrate the spirit of Christmas and the joy of giving I'm taking part in Giveaway Day, and thus I'm giving Flakey the rag-snowflake away to one lucky person who leaves a comment on what they enjoy most about Christmas here on this entry between today and the 6th of December (that's our Independence Day here in Finland!). Every commenter will be assigned a number, with the first person to comment being number 1 and the second commenter would be number 2 and so forth, and then on the 6th, I'll randomly draw a number to see who Flakey will be going home to (I'm happy to ship internationally, so it doesn't matter where you live). Check out the whole long, long, long list of other wonderful crafters participating in Giveaway Day, too, they're all listed at the Sew Mama Sew-blog! The best thing about Christmas for me is the decorations, I put up my Christmas lights up yesterday while listening to Christmas songs and I'm really looking forward to getting a real Christmas tree to decorate again. I buy a few new Christmas tree decorations every year, with most of them being bird-related in some way. Commenting is closed now, and a winner has been picked. Thank you so much to everyone who commented, you've made this a super giveaway! No matter what happens I'll want one for my chil to be born!!! I'm all about the decoration too. I just bought some more yesterday, lovely perlish green and purple balls! Yeppeeee. I love Christmas because it's a wonderful time for food extravaganza... I love the traditional as well as the unusual. The happy atmosphere in the air in December. Somehow people seems to be nicer and kinder than usual. I just enjoy the general atmosphere of Christmas! I love Christmas music, the colors, everything :) It's very warm to me. Very cute! I saw your post on DeviantArt, this guy it great! I think my favourite thing about Christmas and the build up to it is the smells! We started lighting fires with coal and peat turfs in our fireplace which is great. Fresh baked mince pies are wonderful and of course the piney-ness of a christmas tree. Brilliant! I love taking the Christmas season slowly and savoring it as it comes. Cutting a tree one day, making decorations with my family, sharing homemade gingerbread cookies with teaches, etc. OMG! That is sooooooooo adorable!! Love love your little guy! Love the softie snowflake. Your style is so cute. I enjoy being with my family during Christmas. It's relaxing. OMG dear!! I want it!! and i live in Norway now!! So I am on theme with the winter!!!! What an adorable little guy! I love the anticipation of my children for Christmas morning. I think we all become child like at this time of year. Awww, so adorable. I love the spirit of Christmas.My family comes together from all around Finland, we go to church and afterjust talk and eat and enjoy ourselves. It gets reallu quiet here too during Christmas eve. I'ts so peaceful. Love this. So so cute! I love the ornaments (decorations) throughout the house. I love getting together with family and just enjoying their company. I love when the weather gets cold and fireplace comes on. Thank you for doing this cute giveaway! I love everything about Christmas! It's my favorite holiday. Me me me, want want want! My favorite thing about Christmas is picking out presents and then seeing people light up over what I have given them, whether purchased or handmade. I love bringing a smile to others! And I love love LOVE your plush! It's so hard to choose my most favorite thing about Christmas, there are so many! I think it might be visiting with friends and family. I live far away from all of my friends and most of my family, so getting to see them over the holidays is magical! I love the joy I find at making gifts for others--and the joy and love they feel receiving it! I love seeing my kids' excitement Christmas morning after Santa came for a visit! Oh how sweet! What I love about the Holidays is having my brother home. He is in the army and lives a few provinces over, so we only get to see him once a year at best. I love seeing my nephew opening the gifts! I would like to win this giveaway, this will be a great Christmas present! The best thing about Christmas is the excitement of it all! I love how so many people just seem to be giddy all of the sudden! It's just so fun and you can feel the festive nature of the season in the air! My favorite part of Christmas is doing the Advent wreath. I love listening to the story of the birth of Christ being told over the four Sundays of Advent. I love Flakey I love watching my girls open their gifts x-mas morning! What i like about christmas. I think i like the planning most, feeling the christmas vibe and going with it. I'm chaotic most of the year, but when it's about christmas i take my time thinking about the people i love, the gifts i can give them. Finding new things to put in our family christmas tree and the food to make. I get an overwhelming feeling of joy this time of year. Christmas is great weeks in advance, not just on the day itself. That being said: Merry christmas!! Oh, he is too cute! Thanks for the chance to win. My favourite part of Christmas is the smell - the tree, oranges, cookies with cinnamon and ginger, the smell of cold and snow as visitors stop by. 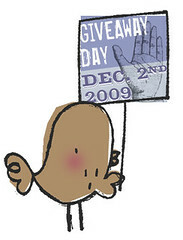 I'm also hosting a giveaway - please feel free to visit! I love watching my husband get as excited as my son getting ready for the season. My favorite thing is having all my family home to play together! My favourite thing about the holidays, other than the family time, has to be the food. We have treats that are only made at christmas, so I wait all year for this! For me the best thing about Christmas is picking out the perfect present. I like to hunt all over and really think about a little treat that would spoil someone! And it doesn't have to be expensive, a lot of times it's handmade by me with love. That's my favorite planning my gift list. I know it sounds so shallow and greedy, but my favorite thing about Christmas is getting gifts! I love to give, too, but the little kid in me still loves opening presents that are just for me! I love putting up our tree while enjoying christmas cookies and eggnog! I love the warmth of Christmas even though the weather is cold and I love going to the worship service at church every year with my family. How cute is that little snowflake ? Love him. I love all the food and making cookies. This little guy is so, so cute!! I know exactly who I would gift him to for Christmas! My favorite part of Christmas is two things: 1. making all gifting all my homemade presents, and 2. being with all my family!